Julie Marcil sent me pictures of her bacon soap and she was kind enough to send pictures and directions of the whole process. I hope you will enjoy it as much as I have. 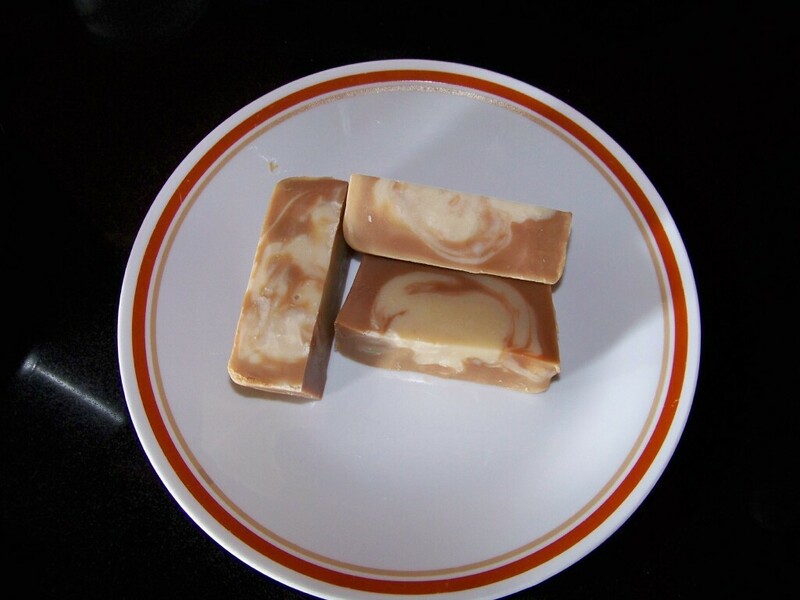 Here my trial at the bacon soap contest for Father’s Day. It doesn’t look as similar to bacon as the one you showed on your blog, but I hope my dad will enjoy using it. 1- Prepare the workspace. Make sure there are plenty of clean working space and good airflow. 2- Gather all safety equipments. I use a long sleeve lab coat, pants and covered shoes that I won’t mind get ruin if a spill happens. A pair of rubber glove and safety goggles. I also make sure that I am close to a source of water and have some vinegar and sponges in case of a spill. 3- Gather all your ingredients. Measure each ingredient. I make sure I am wearing all the safety equipments from the moment I start working with the lye. Prepare the molds. I use mineral oil to coat my plastic molds. 4- Mix the water and lye in the heatproof container until total dissolution of the lye crystals. Make sure you don’t breath the fumes coming out of the solution. They are temporary. Set aside. 5- Slowly heat the oils in the stainless steel pot until everything is melted. Take the pot off the heat source. 6- Once the oils and the lye solution are about 110 F, slowly pour the lye solution into the oils stirring constantly with the whisk. Keep stirring at a good pace until a light trace occurs. With a whisk it takes me about 10 to 15 minutes. 7- At light trace, add the flavor oil and mix well. 8- Take about half the soap solution into another container. Set aside. Add the reduced red wine to the other half of the soap solution and mix well. 9- Pour the soap with red wine to fill half of the plastic molds. Then slowly pour the other half of the soap solution to fill out the rest of the molds. 10- Cover the soap molds with the old blanket and let sit for at least 24 hr or until firm. 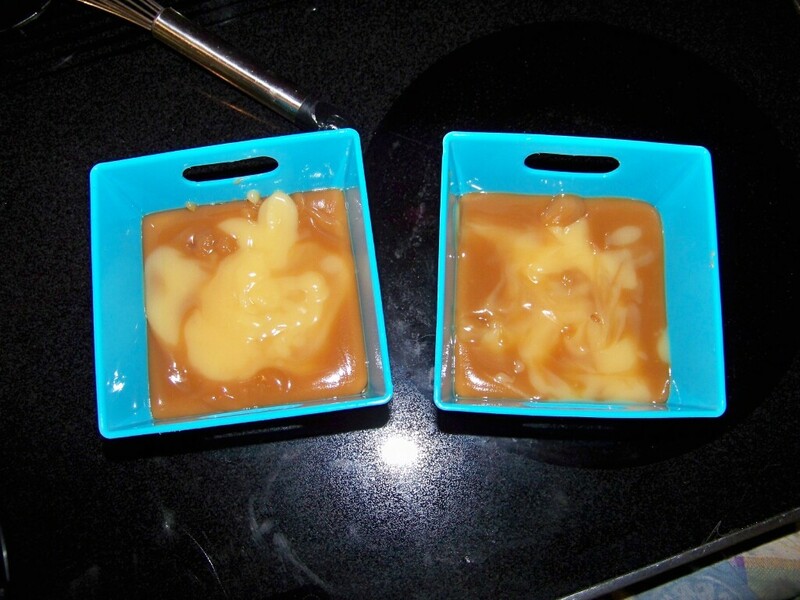 11- Take the soap out of the molds, cut in desired size and let cure in a cool dry place for four weeks. The ingredients in my vegetable shortening included canola, soybean and palm oil. I use soybean to calculate the amount of lye needed since it is the oil that takes the less lye among the three. I use red wine that I simmer until all the alcohol was evaporated and the liquid reduced by half. I was hoping the red wine would give a light red color to the soap. 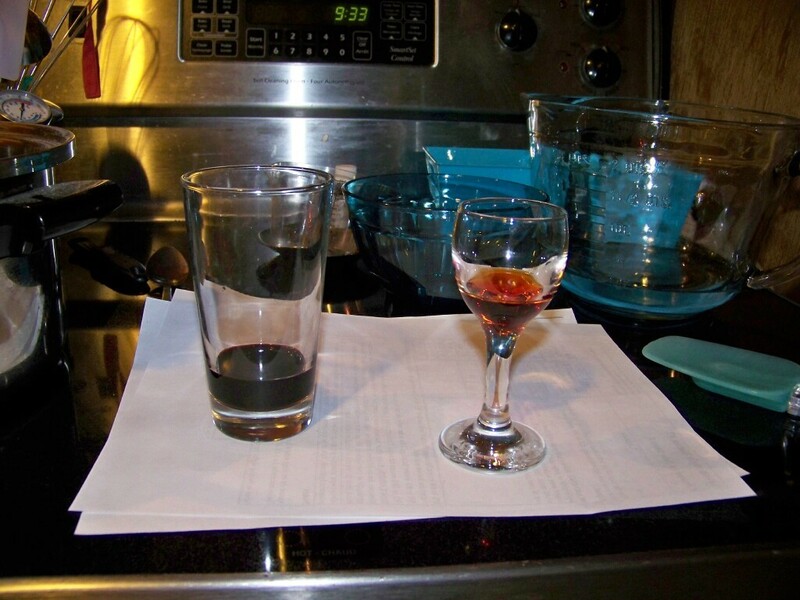 However, the slight yellow color of the olive oil and the blueberry flavor oil gave the soap more of a brownish color than red when mixed with the wine. Red wine, flavor oil and lye solution. 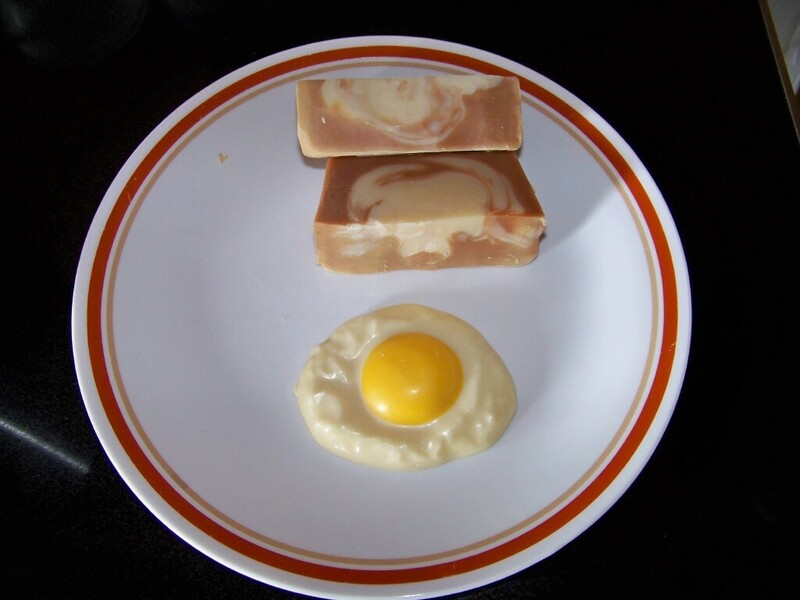 Bacon soap with fake egg. Your bacon soap just looks like it has been cooked. This was fantastic. I had a lot of fun making that soap and the blueberry smell so good!